Five years may be too early for an event to be considered an “institution.” But it’s long enough for EVE Salt Lake City to be established as Salt Lake City’s showcase blowout for ringing in the new year. According to Nick Como of the Downtown Alliance, somewhere in the neighborhood of 40,000 people typically head to EVE activities over the course of the three days and nights—Dec. 29-31—when events are taking place. Yet despite the obvious popularity of the event, the organizers continue to tweak the formula in an attempt to make it even more attractive, both to those who are regulars and those who might be considering a first-time visit. Perhaps most significantly, the hub of EVE has moved from the Gallivan Center to the Salt Palace (100 S. West Temple), allowing more indoor space to take the edge off of chilly nights. EVE will feature the kid-friendly Bounce Town, the BallRoom (a music and dance party filled with hundreds of beach balls) and—one of the new events—a cash-prize costume contest sponsored by Salt Lake Comic Con on the evening of Dec. 30. DJs, dancing, live music (see p. 30 for details) and an exciting performance by Samba Fogo will also be centered at the Salt Palace venue. The $15 wristband price will be good for many of the same venues and activities that have been part of EVE in past years. The Off-Broadway Theatre (272 S. Main) hosts Laughing Stock improv comedy performances three times nightly (7, 8 & 9) on Dec. 29-30, and five performances (7, 8, 9, 10 & 11 p.m.) on Dec. 31. Broadway Centre Cinemas (111 E. 300 South) presents programs of Charlie Chaplin shorts daily as a laughter-filled respite from the chill. Attendees can also enjoy large-format movies at the Clark Planetarium (110 S. 400 West) in addition to the other exhibits and activities. Those brave enough to perform can try out artist-created karaoke videos and games of chance at the Utah Museum of Contemporary Art (20 S. West Temple). Most of the exhibits at The Leonardo (209 E. 500 South) will also be open for exploration, though the current Dead Sea Scrolls exhibit will require a separate additional charge. Temple Square (50 W. North Temple) also hosts its traditional array of New Year’s Eve activities—including a scavenger hunt, Ellis Island “dock” photos, family-friendly games, a Broadway showtunes sing-along and more than a dozen live-music performances—for all visitors, even without an EVE wristband. You can even find something intriguing as you stroll between venues. #secretEVE provides an interactive experience for pedestrians between The Gateway, UMOCA and the Salt Palace, as 14 local artists have created small-scale installations along South Temple and West Temple. Watch the sidewalk for clues, then share photos of the installations via social media. In addition to the Salt Lake Comic Con costume event, the other major addition to EVE’s one-wristband-for-everything package is NBA basketball. The Utah Jazz game vs. the Charlotte Bobcats on Monday, Dec. 30, will be part of the EVE family, allowing fans a uniquely inexpensive chance to see the new-look team as it tries to build on a foundation of young players. Visit the Salt Palace on Dec. 30 before game time to reserve seats. It all culminates, of course, in the fireworks show at midnight Dec. 31, which can be viewed all over downtown. And while parking is available at City Creek and The Gateway—with validation available for those who dine and/or shop there—visitors are encouraged and able to take Trax all three nights, including group passes good for up to six people, and late service on New Year’s Eve extending to around 1 a.m. for all lines. 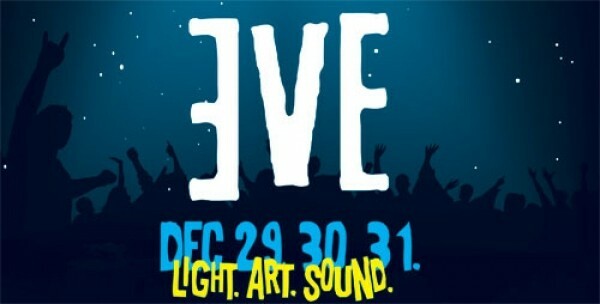 Indoor or outdoor, adult or child, dance enthusiast or sports fan, EVE is turning more and more into the kind of event where “something for everyone” is more than a cliché. And that’s how you become an institution.